The banning of tourism across the core areas has really made a difficult U-turn in the face of tourism all across India. There are almost 40 national reserves in the country which are facing the difficult situation of banning the core areas. The forest officials of the Corbett Reserve Department have brought a fantastic resolution out of this timid situation. The Ramnagar Forest Division, under the Corbett Tiger Reserve is planning to organize a landscape day-visit along the Ramnagar division. Earlier the visitors used to thrive across the core zones to explore the Corbett ’s wilderness but the good news is that the Ramnagar Forest Department has prepared a layout for the same to the proposed rule to the department. The state government along with the tourist organization is also setting alternate options to continue with the tiger tourism in India. And for the same purpose, the Jim Corbett Tiger Reserve has allowed for a safari day-visit at the Ramnagar area, a part of the Corbett landscape. According to the Ramnagar forest official, Premshankar Shrivastava, the department has already permitted for the eco-tourism for Ramnagar forest division. The tourists were already making their visit to these areas to catch the glimpses of the rare species that used to frequently roam at this region. And today the day-safari will bring more charm and attraction to this region. The Sitavani and the Pawalgarh regions are already being used for the same and the proposal to visit these areas have already been sent to the State Government. 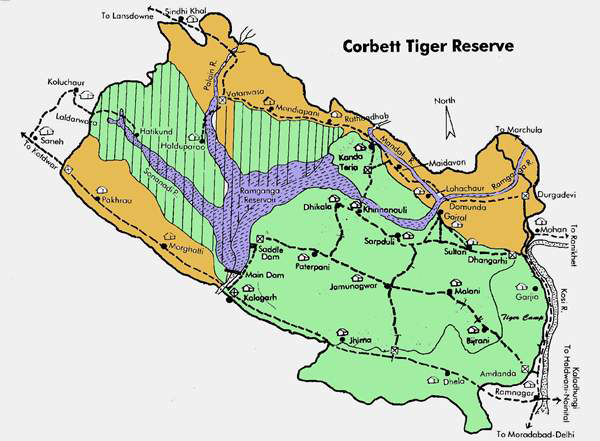 The Corbett Park administration was claiming to the presence of at least 214 tigers in the area and surprisingly more than half of the counts are available at the Corbett landscape area (Ramnagar and lowland area); out of which the Ramnagar area boasts the maximum counts of the tiger species. Apart from that the presence of other majestic species including elephants, deer, Barasingha etc are making these areas more prolific. The Ramnagar area will definitely bring much attraction to the tourists as there are not only the fascinating landscapes, but the presence of many religious destinations and spots will motivate the tourists. These attractions may include the Valmiki Ashram, Maa Sita’s meditation site, Maa Garziadham along with the fascinated Tourist Corbett Fall.